As part of the monitoring and review exercise for Bio-Innovate projects conducted between May and October 2012, the Bio-Innovate Program Management Team (PMT) traveled to Kampala, Uganda on 29-30 October to review implementation progress made by project 6 on ‘use of biosciences for value addition and diversification to enhance commercialization of sorghum and millet products in eastern Africa’. The project focuses on use of bioscience for value addition, diversification, and commercialization of sorghum and millet products. 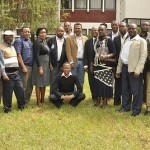 In attendance were the project leader, Sokoine University of Agriculture (SUA), co-principal investigator, Makerere University (MAK), Co-PI, Hawassa University (HU), one each industrial collaborator fromMorogoro Ben’s Winery in Tanzania, Lisha Products Ltd. Uganda, Addilo Complementary Foods Process Unit Ethiopia, as well as the PMT, and Victor Konde representing the technical advisory committee. Jovin Mugula the principal investigator highlights the achievements of the consortium during day one of project 6 monitoring and review meeting (photo credit: Bio-Innovate-ILRI/Albert Mwangi). With the focus on value addition for millet and sorghum grains the consortium will deliver high quality sorghum malt flour (HQMF), clear malt drink (CMD), malted extruded instant flour (MEIF), sorghum flakes (SF) and sorghum snacks (SS). 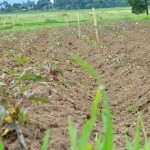 In addition to these products, the consortium plans to promote best practices along the sorghum and finger millet value chains, enhance capacity of small and medium enterprises (SMEs) in supply of quality sorghum and millet grain, malting processes and extrusion technology, and dissemination of technology for commercial production of high quality millet and sorghum products. 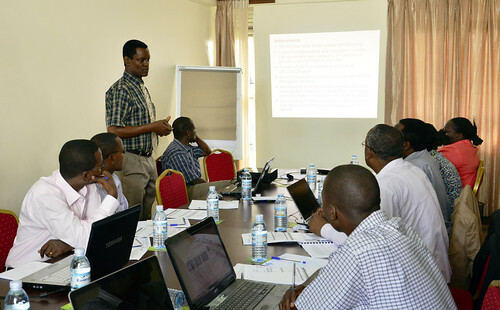 The project falls under the “innovation incubation and promotion of targeted value chain” thematic area of the Program and the PMT was interested in assessing the incubation system at the Department of Food Technology and Nutrition of Makerere University. The University has set up an incubation center that is nurturing several start-up small-scale food processing enterprises. One such enterprise is Lisha Products Limited in Uganda who is interested in industrial commercialization of value added products from sorghum and millet grains. The Department of Food Science and Technology at Makerere University in collaboration with Lisha Products has so far developed several Bio-Innovate branded products including malted non-alcoholic drinks and ready to eat sorghum and millet extruded snacks. These products are later sold to the larger university community. Lisha Products is using this opportunity to evaluate the acceptability, quality, and safety of these products and refine them further before full-scale commercialization. 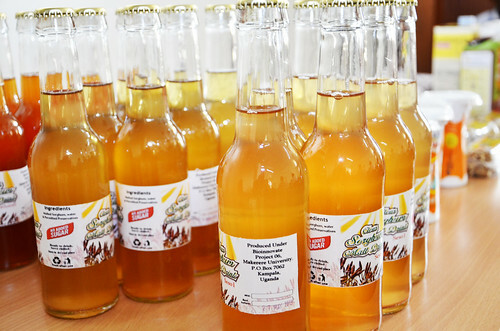 Clear malt drinks made from sorghum extrusion is one of the products project 6 is producing (photo credit: Bio-Innovate-ILRI/Albert Mwangi). The group also took the opportunity to visit Peak Value Limited a food-processing factory that produces sorghum and millet products. 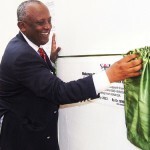 Peak Value Limited is collaborating with the consortium to provide extrusion facilities for the production of some of the products produced by Lisha Products Ltd. 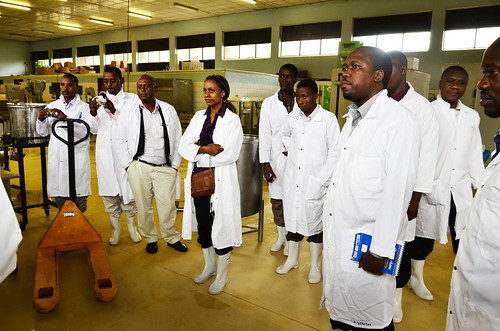 In turn, the consortium through the co-principal investigator, Yusuf Byaruhanga, is providing food processing technical assistance to the factory. Peak Value Ltd is interested in taking up sorghum and millet value addition innovation technologies developed by the consortium. This symbiotic relationship embodies the Bio-Innovate Program core objective of creating innovation platforms through partnerships that are aimed at delivering innovations to end users. 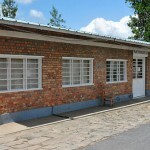 The Makerere University incubation center (photo credit: Bio-Innovate-ILRI/Albert Mwangi). The consortium is making commendable progress but equipment procurement delays have greatly impeded their progress. This coupled with other institutional challenges has impaired overall progress made by the consortium with original timelines severely compromised.In view of these difficulties, Seyoum Leta, Program Manager, advised the consortium to closely work with the Program Management Office (PMO) in the future when acquiring equipment and especially when procuring from international suppliers. Assessing the progress of the consortium, Seyoum advised the partners to immediately review the consortium logical framework matrix (LFM) and works plans and make appropriate adjustments to align timelines that reflect what is achievable in the remaining time of the three-year project. In addition, Seyoum requested that the consortium technical project reports should accurately outline results and milestones achieved in reference to the LFM. When reporting in the next reporting period, the consortium’s technical progress report should indicate clearly the private sector role and involvement as their participation in the consortium is crucial in the uptake of the commercialization of the value added products. Gaming Scene in Africa | Maliyo Games Vs Ma3Racer Is Your Company Ready for the Reverse Innovation Revolution?